The Fuselage (Part 7) page documented the work done on the fuselage section that contained the cockpit tub. 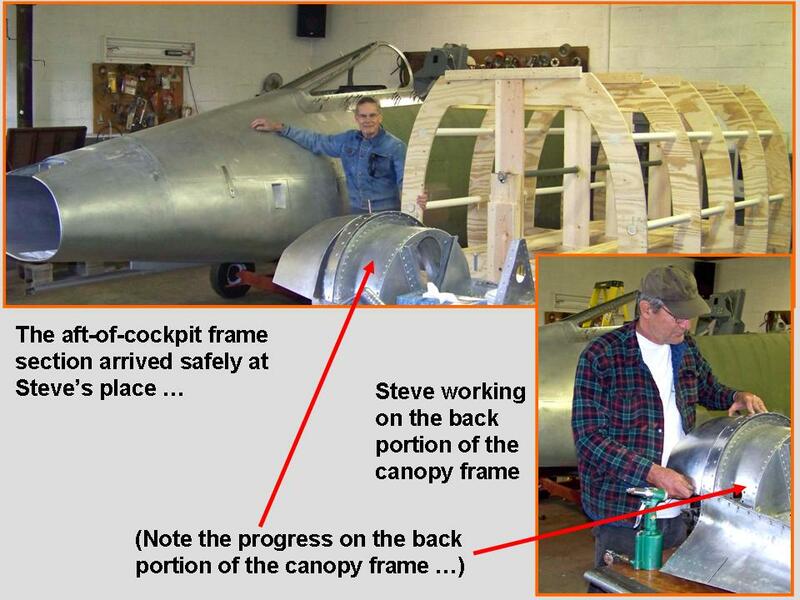 On this page, I'll document the "manufacture" of the 97-inch fuselage section just aft of the canopy. 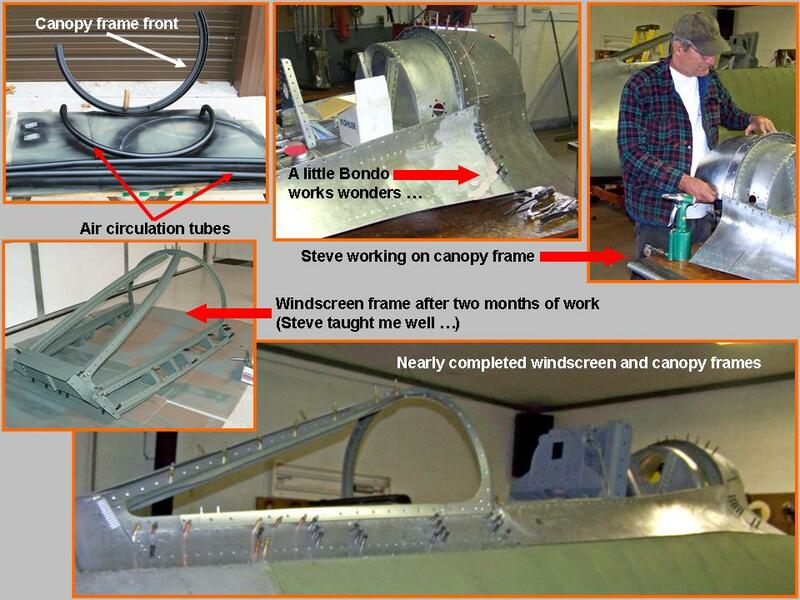 I'll also show the completion of the windscreen and the canopy and I'll show the attachment of this new fuselage section to the 23-foot fuselage section that was shown on the Fuselage (page 7) page. Finally, you will see the completed paint job on the combined fuselage sections. 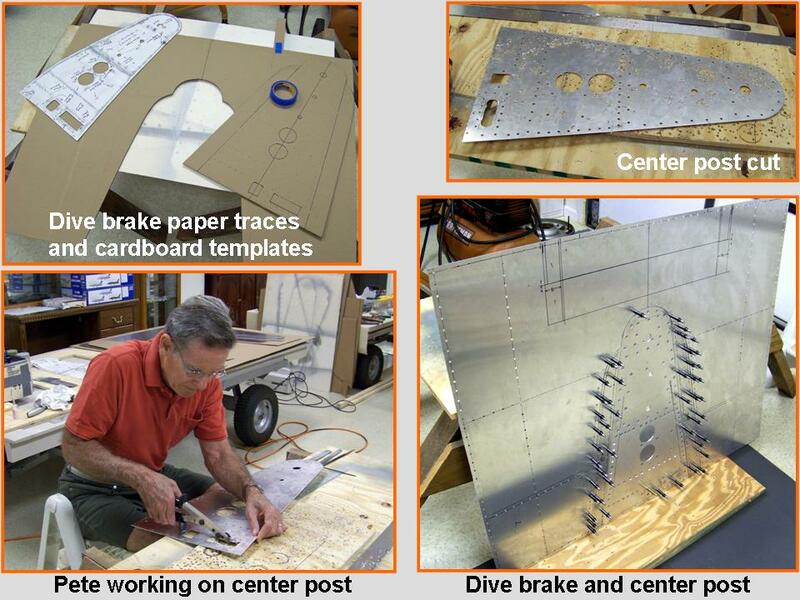 As you can tell by looking at Figure 1, cell 03, the manufacturing process remains the same ... the paper tracings of the real airplane components are copied to thin cardboard, the fit is checked carefully, and the cardboard then becomes the template for the aluminum piece. 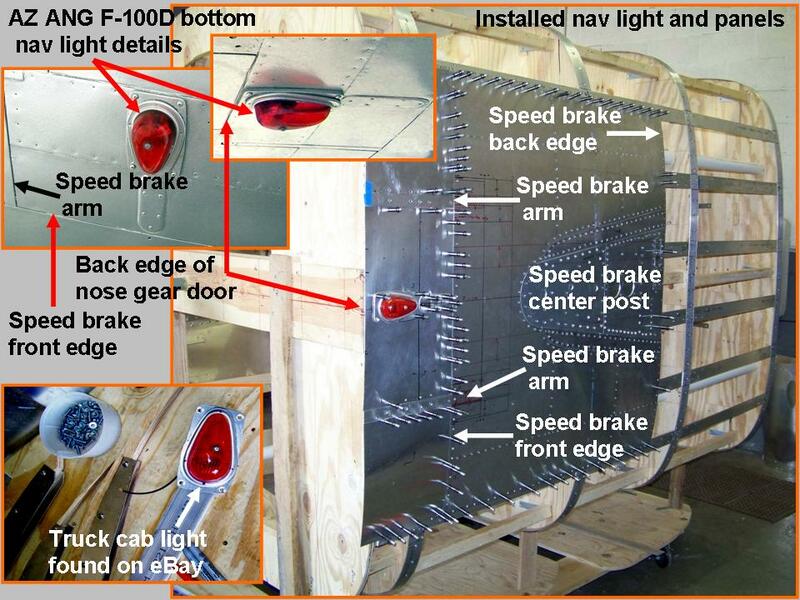 About your use of the “dive brake” label, I'll be a nit - call it a "speed brake". In fact, that's what the -1 says; all of us used the term, and it's printed on the throttle switch (the one on top that lowers and raises the "speed brake". I think "dive brake" went out of use in WWII. The cutout on the speed brake enables us to carry a centerline store - originally for a nuke, but probably more often was a SUU dispenser for carrying practice bombs. The SUU-21 (? I think) had doors that you had to open that replicated "arming" the nuke. I remember the low level rule was to not bring grass back in your SUU. We decided to wait until the canopy was in place before attaching the new fuselage section to the now-completed front fuselage section. 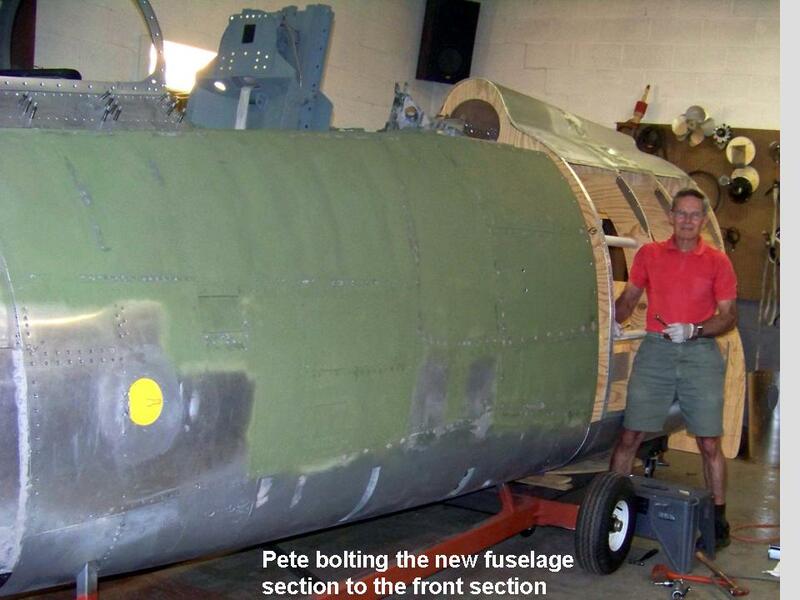 (You can check the Fuselage (Part 7) web page to see the completion of that front section.) 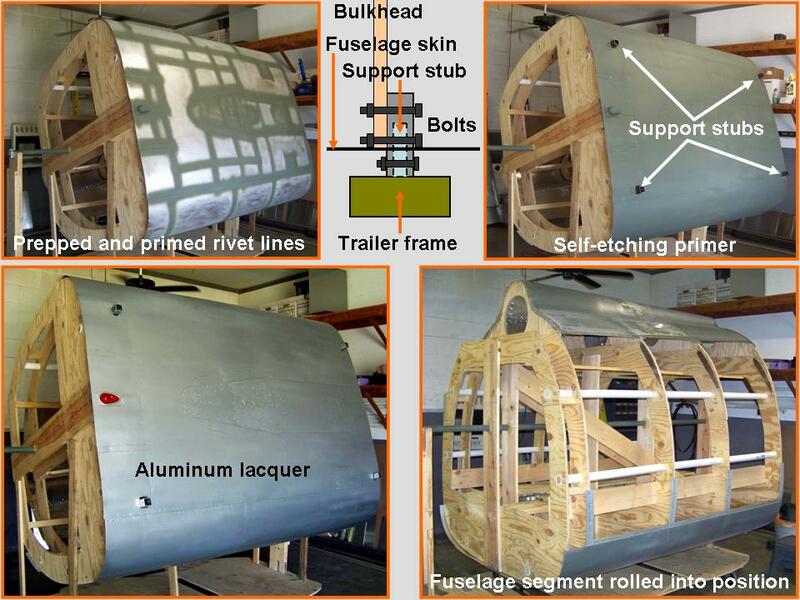 In the meantime, we could start putting the aluminum components on the bottom of the new aft-of-cockpit section. I had already completed much of the dive brake section, so that would be a logical place to start. 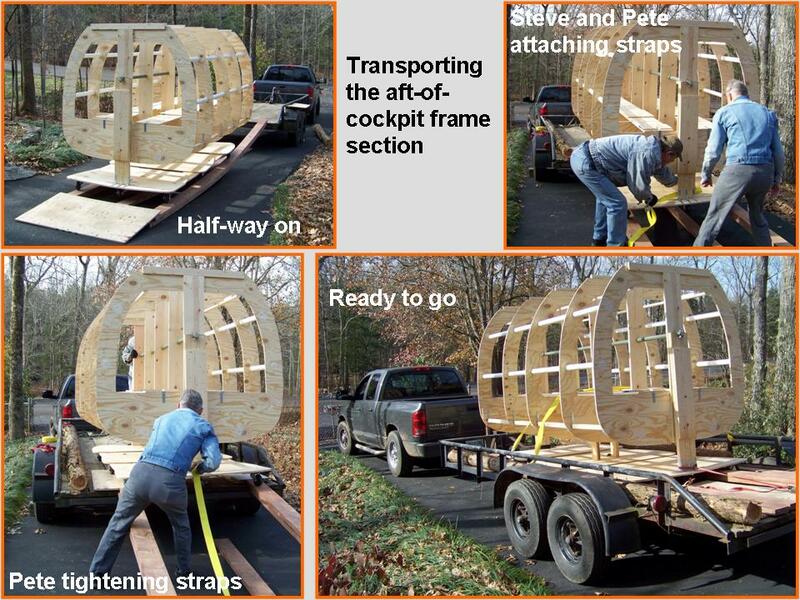 The composite picture in Figure 2, cell 01, shows us loading the new fuselage section on Steve's trailer. Cell 02 shows the new section in Steve's workshop. If you take a good look at the composite picture shown in cell 02, you can see that we have made some progress on the windscreen ... all the frame strips are done and the only remaining work will be the installation of the windscreen glass. (We need to find a good way to get new plastic pieces to fit the frame. We're hoping that this job can be farmed out -- molding thick plastic into the proper shape without causing distortions is likely to be well beyond our skill set. If you know somebody who might be able to get this job done without demolishing my strained piggy bank, please let me know!) Cell 03 shows the work done on the strip of inspection panels. 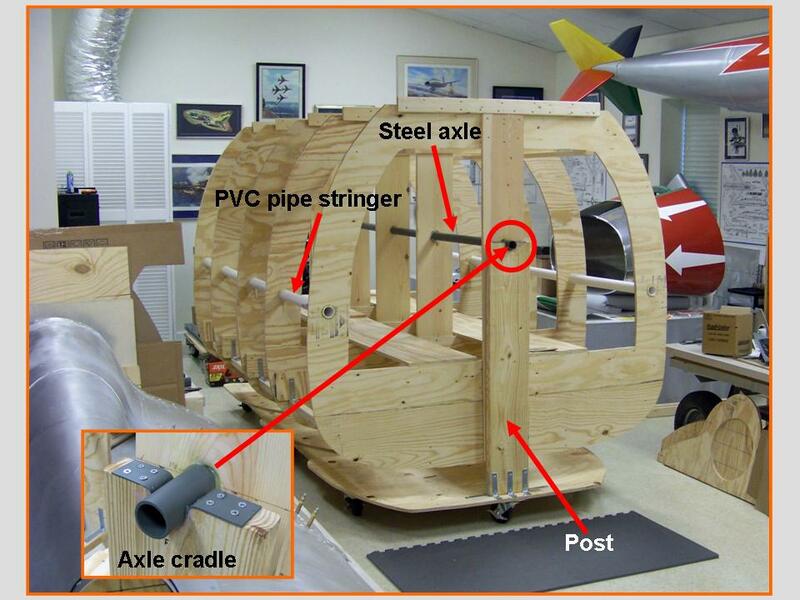 Note the photo that shows the strip of inspection panels along the left side of the fuselage. After the fuselage frame was finally completed, it was time to hang the speed brake in its proper place. The composite picture in Figure 3, cell 02, shows the speed brake attached ... with clecos at this point. The picture also shows the two panels that will be tackled next. Incidentally, the nav light in the 1/48-scale model is supposed to be red ... I had not yet painted it. I found a perfect (vintage) red truck cab light that was exactly the right size and shape to fit the nav light panel. 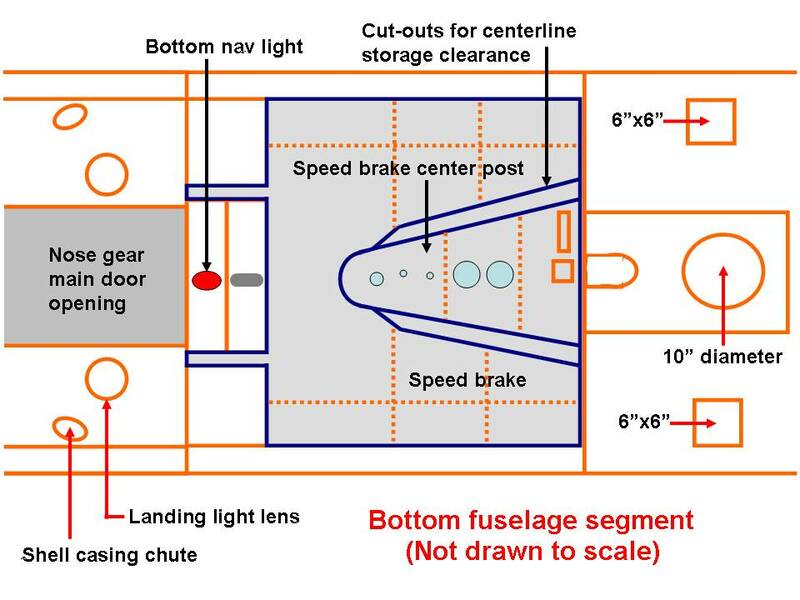 (The next search routine would have led me to look for old Sabreliner lights -- the old Sabreliner has a LOT of parts that fit an F-100 very nicely ...) Anyway, the composite picture in Figure 3, cell 03, shows the work done on the nav panel light. The work is not quite done yet ... for one thing, the clecos will have to be replaced by the appropriate rivets and screws. 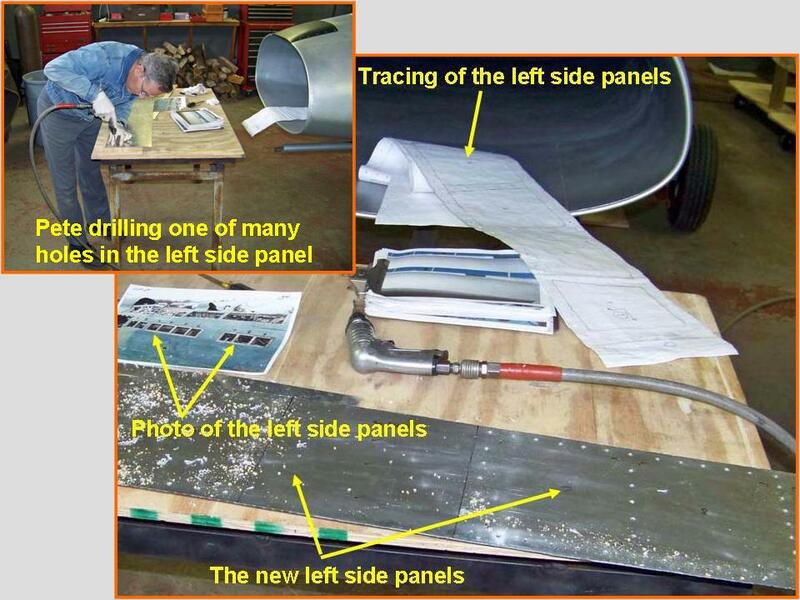 After installing the speed brake and the panels just in front of it, the time had come for a serious look at the many remaining bottom panel tracings. To make sure that I would know which panel went where, I made an "overview" sketch as I was making the tracings. To help preserve the documentation, I made a Powerpoint slide, then saved that slide as a .jpg file for use on this website. You see the results of that effort in Figure 4, cell 01. The two 6x6 access panels cover the fuselage tank probes, the round one is for the fuselage boost pump, the U-shaped one is for the cannon plug when we had a nuke on the centerline. I don't remember what the two larger round holes were for. I do know that those holes had nothing to do with fuel, since we didn't carry fuel on the centerline. I'll have to do some more research. 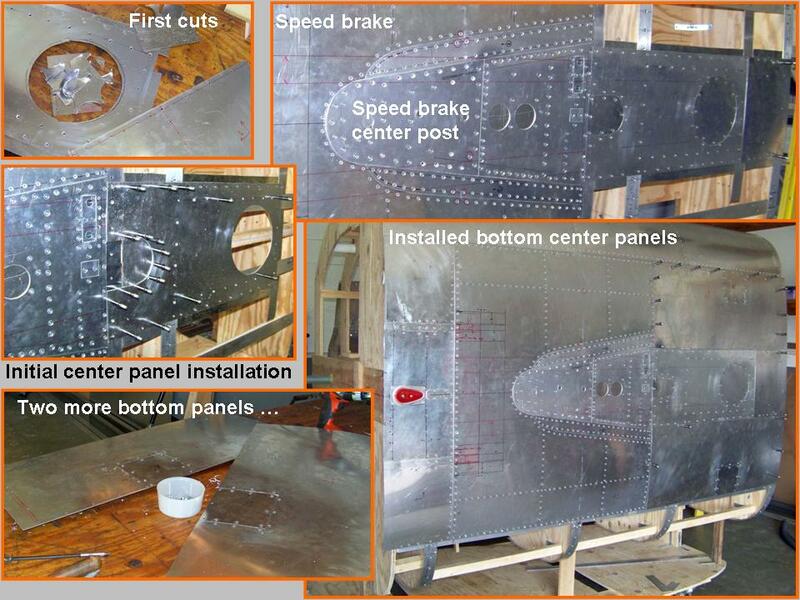 After the center panels were checked for their final fit, the seemingly endless drilling began to make the various fastener holes for the rivets and screws. 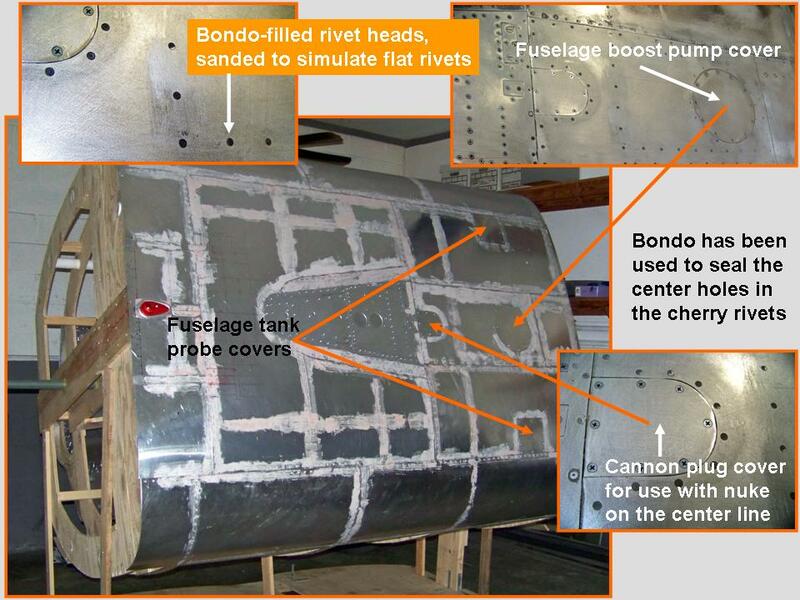 (There are a LOT of rivets in these fuselage bottom pieces!) Each hole had to be de-burred to produce a clean fit against the stringers. After the panels were properly de-burred, they were attached (again ...) with clecos. Finally, each hole had to be counter-sunk to ensure that the fasteners would be level with the panel surfaces. Finally, the riveting began to attach the panels permanently. You see the partially completed results in Figure 4, cell 02. 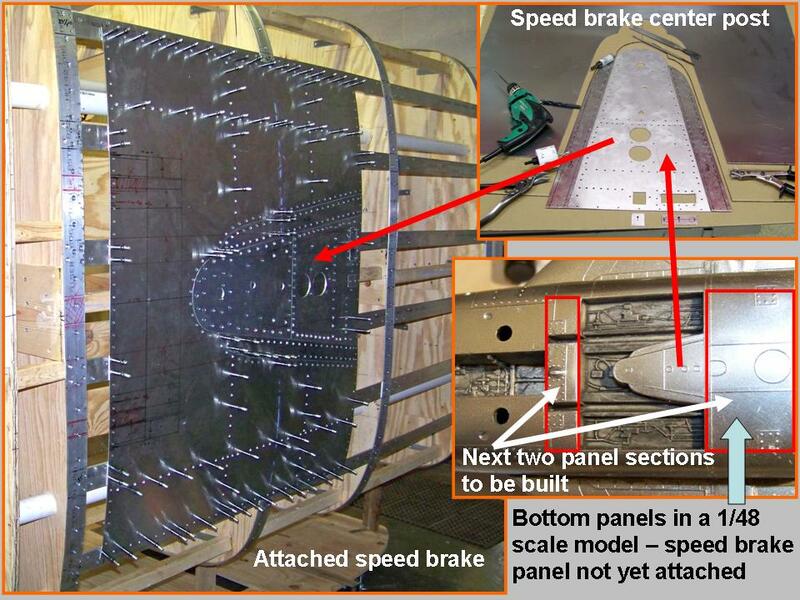 The nearly completed bottom panel section is shown in Figure 4, cell 03. When the new bottom section skin panels were all in place and properly prepared, it was time to spray the panel lines with self-etching lacquer and to perform a final check to see if the Bondo work had yielded the desired results. In the meantime, we had installed four steel support stubs. These stubs will later be used to anchor this fuselage segment to the trailer extension. 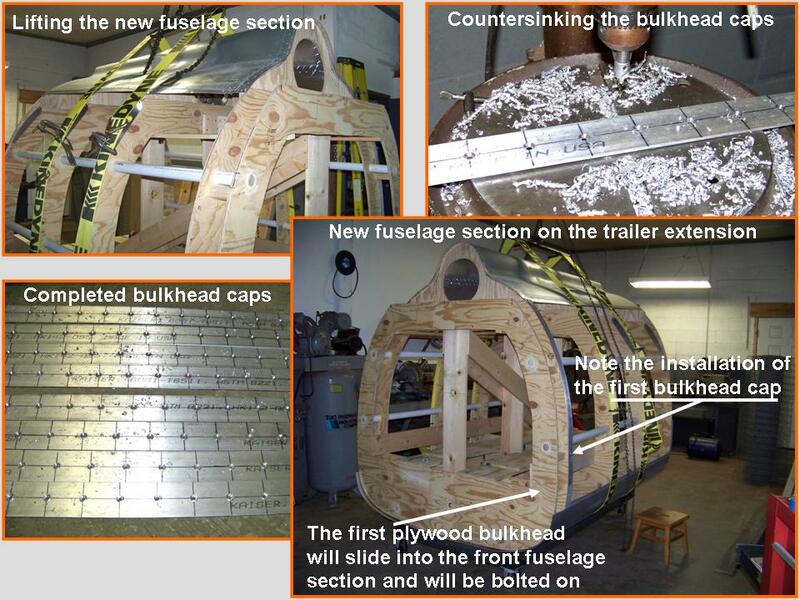 In turn, that trailer extension will be attached to the main trailer ... proper alignment will ensure that this fuselage segment will fit the fuselage section in front of it. Next, two coats of the self-etching primer were applied to the entire surface, followed by more sanding. When the surface looked nice and smooth, I applied two coats of aluminum lacquer, followed by a finishing coat of "brilliant alluminum" lacquer. 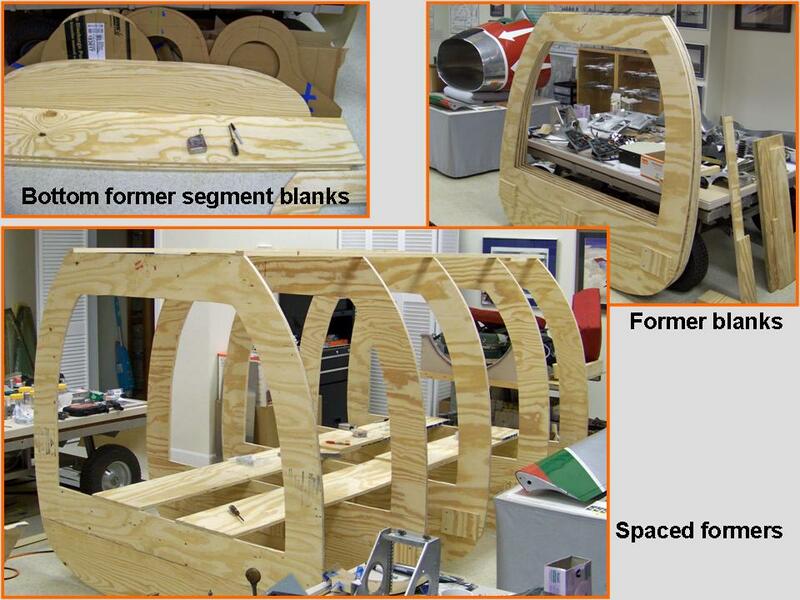 Finally, we rolled the fuselage segment level in preparation for its attachment to the trailer extension. Figure 5, cell 01, shows a composite picture that illustrates the process.